By Aditi Shrikant – It’s a Sunday morning and things are little quieter than usual at the National Museum of African American History and Culture in Washington, D.C. There are 63 families in the entire musem and they have free range of every floor. The lights are dimmed in some exhibitions, and in others, the sound is turned to a low volume. “My son is an artist, so anything that has to do with art, coloring or drawing different things, he likes,” Yetta Myrick says. This particular event hosted a “make your own corona” activity on the second floor. For the past four years, Yetta and Aiden, her 14-year-old son with autism, have been attending “Morning at the Museum” events at Smithsonian institutions around the city. The program, which started in 2011, offers early entry and sensory-friendly activities to those on the spectrum of any age. “As a parent, you want to have similar experiences as your child, and this has really opened the door as if we were a quote unquote neurotypical family,” she says. The Smithsonian Institution has been among the first to develop programming with the intent to make its museums more accessible and enjoyable for those with developmental disabilities. For the past decade, cultural institutions all over the country have been reaching out to families and experts to see how they can better accommodate those with autism. Elise Freed-Brown, who now works at the nonprofit Girls Inc., studied museum professions at Seton Hall University. Her 2010 thesis, entitled “A Different Mind: Developing Museum Programs for Kids with Autism,” delved into what institutions can do to make themselves more welcoming to those with Autism spectrum disorder (ASD). She interviewed museum instructors and studied the programs at the Museum of Modern Art, The Metropolitan Museum of Art and the Children’s Museum of the Arts to see how they altered their spaces and tailored their programs to not overload the senses. Freed-Brown says that it is important not to assume that kids with autism cannot handle going to a museum during regular hours. But noise and light, along with social and language expectations, can induce stress for children on the spectrum, who are less able to self-regulate. She found it critical to eliminate potential unexpected stimuli, as 42 to 88 percent of those with ASD have “unusual sensory responses,” such as repetitive motions or fidgeting, to being overstimulated. “Especially in children’s museums there is a tendency to use the five senses, which is great as long as there is a way for them to turn other stimuli off so they can focus on the one thing,” Freed-Brown says. This means anything in the museum that is not part of the exhibit but is also stimulating—for example bright lights, loud sounds, big crowds—should be toned down, turned off or removed. Providing special hours is a common and effective method for cutting out lots of stimuli, as a crowd itself induces stress, along with all the unexpected noises it brings with it. Museums can also dim lights, lower volumes and be cognizant of other possible distractions. Even a flickering light could be overwhelmingly distracting to someone with autism, Freed-Brown says. The programs Freed-Brown studied all implemented a routine. Visitors reportedly found comfort in the structure and its predictability, and they were better able to address challenges and transitions when they knew they were coming. While the activities or themes of the events varied from visit to visit, the schedule stayed the same. The museums provided short activities and kept tour groups small. Staff offered kids praise, and in doing so, assured them that they were in a safe, fun and welcoming environment. But, perhaps the most important step a museum can take, Freed-Brown says, is to train their staff to be amenable, as every child on the spectrum has different needs. “Museums that were really successful were ones who were listening to the caregivers,” she says. “Where people leading the programs were extremely flexible.” In these programs, children became calmer and more attentive the more they attended. 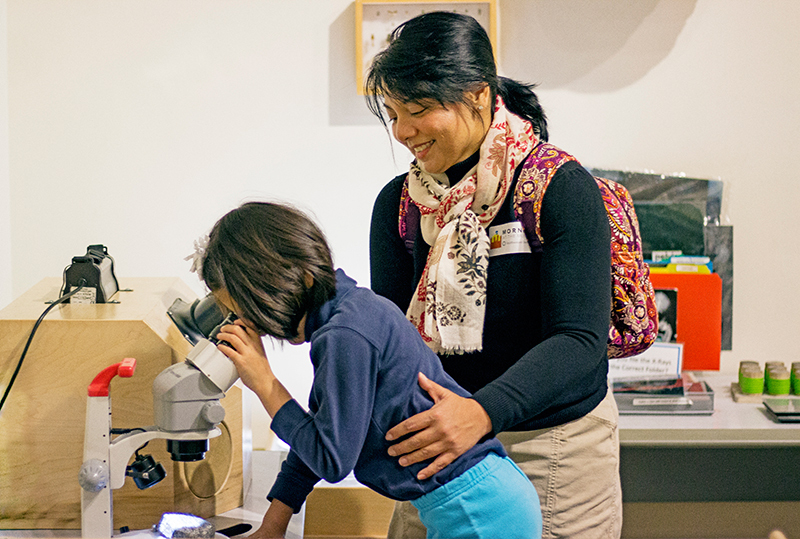 At the Smithsonian, a community advisor committee was formed in 2011 in response to phone calls and emails from parents with kids on the spectrum who wanted to know if museums offered early hours or programs for those with developmental disabilities. The committee consisted of museum educators, special education teachers, an occupational therapist from Temple University, and a self advocate (someone with autism). Ashley Grady joined the team in 2015 and has been working to expand the existing program and resources developed by the committee. “After the committee was formed, they started thinking about how this would actually look,” Grady says. “What do we need to give parents and what is going to help welcome them and make it an easy and meaningful experience?” Grady says many of the institutions the Smithsonian looked to as models were zoos and aquariums, along with other arts organizations like The John F. Kennedy Center of Performing Arts. Based on these models and their own research, the committee focused on three key implementations: pre-visit materials, early entrance and a take-a-break space. Twelve families attended the very first “Morning at the Museum,” held in 2011 at the National Museum of American History. Now, depending on how much space in the museum is available, the events can host anywhere from 25 to 80 families. “If we have a program at the National Portrait Gallery and have two to three galleries open, we could have 125 to 150 people,” Grady says. “Contrast that to the National Air and Space Museum or the National Museum of African American History and Culture, where they give us the whole building. We can have 350 people, and it doesn’t feel crowded.” In 2017, “Morning at the Museum” was held on 12 Saturdays and Sundays throughout the year. At the National Museum of African American History and Culture event this December, doors opened at 8:30 a.m.—an hour and half before the museum opens to the public. This reduces wait time and crowd size, two points of struggle for visitors with autism, and allows the museum to make special accommodations that they may not be able to do during regular hours. Pre-visit materials for this event included social narratives of several galleries, and families were free to roam the entire space. A picture-based sensory map used icons like a hand, yellow circle or ear to show that exhibits have a tactile element, or are very bright or loud. The museum also provided a visual schedule and a tip sheet with parking, restroom and basic sensory information for parents. Families filtered in and out of the dimly lit take-a-break space on the concourse level, which was filled with large mats, pillows and sensory toys, like a stretchy body sock and fidgets, which are stress balls, tangles and other tools that can help someone to calm and focus. Similar programs exist at other institutions, as well. The Walters Art Museum in Baltimore has offered early entrance since 2010, and provides museum-goers with “Social Stories,” or first-person guided narratives, to help families prepare for the day, and thematic, sensory-based stations where they can craft, do yoga, or take a break in a dimly lit area filled with weighted vests. For Manhattan’s Intrepid Sea, Air & Space Museum’s early openings, educators email families visual vocabulary, a schedule and an illustrated social narrative in advance. Museum staff also have toys like Tangle Creations—twisty sculptures that pivot at various points—and noise cancelling headphones on hand for kids who get fidgety or overstimulated by the volume of some exhibits. At the Please Touch Museum in Philadelphia, families are offered Quiet Kits that include sensory cool-down items, like fidgets. In addition to hard materials, many institutions are building apps that provide maps and sensory information. The Shedd Aquarium’s Sensory Friendly App includes photos and tips on temperature and noise levels in various exhibits. This technology is also helpful for adults on the spectrum who may find it too stressful to ask for help from museum staff. Going into 2018, Grady says that the Smithsonian’s “Morning at the Museum” will be expanding to host 25 programs a year (with registration now open for events on January 20, February 3, February 10 and February 24) and accommodate a wider range of visitors, including those with Down syndrome and cerebral palsy—many of whom are already attending. “We found that individuals with a variety of backgrounds can benefit,” she says. By hosting more events and offering more activities, she hopes to reach more kids than ever, and eventually create a sister program to host social events for teens and young adults with autism. “My goal is to have that in place by 2020,” she says.